In this article, we would briefly discuss the importance of prenatal attachment (the emotional bond that develops between the parents and the growing fetus during pregnancy). This is an important determinant of the future parenting style and parent-infant attachment, both of which play a vital role in the future social interactions of the child. We would explore which factors can influence this unique parent-fetal relationship during pregnancy. 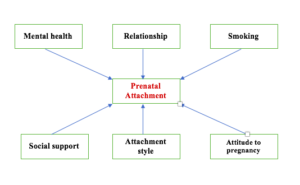 Before we discuss prenatal attachment/ bonding, it is important to understand some key aspects of attachment. The emotional bond that connects one human being to the other is called ‘attachment’. The type of attachment behaviour (also called an ‘attachment style’) is unique to every individual. Therefore, the attachment style of one person towards the other is not necessarily reciprocal. How the attachment evolves throughout the life of an individual? Research has shown that the attachment between the parent and the child (especially within the first two years of birth) form the basis of the future relationships with parents/ peers/ partners/ other human beings. The process starts inside the mother’s womb when the would-be parent develops an imaginary connection with the growing fetus. This is called prenatal attachment. This relationship takes a new form after the baby is born. The newborn baby develops a connection with the parents (or caregiver). This is called the parent-infant attachment. 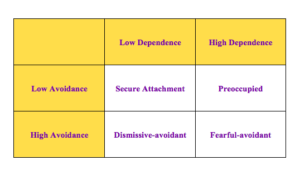 Depending on the response/ parenting, the baby develops one of the few attachment styles (secure/ insecure/ disorganised). The parent-infant attachment is carried by the human being throughout (childhood, adolescence, and adulthood) the rest of the life (‘cradle to grave’). This would influence how they enter into, maintain, and end a close relationship with others, including their life partners. It is important to remember that the parent-infant attachment style is not permanently engraved into the baby’s personality/ behaviour. For example, as the child grows older, different social/ environmental/ personal life events/ experiences keep on molding the initial attachment style. An insecure/ disorganised attachment style can be changed to a secure style with an early intervention. Therefore, the parents/ caregivers must be reassured if their children are found to have developed those attachment patterns. At the same time, a secure attachment style can become an insecure pattern with exposure to abuse/ maltreatment/ other harsh experiences of life. Therefore, every parent/ caregiver should be given adequate information on the parenting and attachment style of the children. To understand the attachment phenomenon better, let us now discuss prenatal attachment. What is a prenatal attachment? Research has indicated that the parent-infant relationship, in fact, starts developing during the pregnancy. The prenatal attachment is the bonding that develops between the parent/s and the growing fetus during pregnancy. Both the mother and the father can develop this bonding. 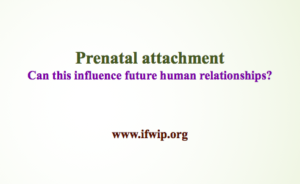 Therefore, ‘prenatal attachment’ is the phenomenon not only applicable to the pregnant women but also to the parents too. What is the difference between prenatal attachment and parent-infant attachment? The prenatal attachment is different from the parent-infant attachment, although they are closely linked. The prenatal attachment is the feelings of the parents towards the baby during pregnancy. Whereas, the parent-infant attachment occurs after the childbirth (post-partum period). It is the sense of security perceived by the infant towards the parent (or the primary caregiver). What is the mechanism for prenatal attachment? The exact mechanism for the bonding is not known. The imaginary picture of the baby in the parents’ mind and the emotional responses of the parents towards the pregnancy/ baby are thought to contribute mainly towards the bonding process. Can fetal behaviour/ activity influence the mother’s feelings/ bonding? The fetal activity has been shown to stimulate the bonding response for the pregnant women. This ‘upstream’ connectivity can influence the mother’s psychological adaptation during pregnancy and parenting. However, more research is required to understand this ‘upstream’ mechanism (i.e., from the fetus to the pregnant woman) of prenatal attachment. Can a newborn have a memory of the experience during the prenatal period? The historic and traditional view is that the baby is born without any possession of knowledge in the mind. This has been termed as ‘Tabula rasa’. ‘Tabula rasa’ is a Latin phrase which means a ‘Blank Slate’. It has been believed that all the knowledge is gained after the birth through the perception and experience of the individual. However, this concept has been challenged by many scientists. Reseach has shown that the newborn babies seem to recognise the sound exposed during pregnancy, such as mother’s voice, melody, and story. Why is the prenatal attachment important? During the prenatal attachment process, the parents imagine about baby’s look, activity, and development during the forthcoming years. This bonding process helps parents to develop more love, compassion, and affectionate feelings for the baby. Therefore, the prenatal attachment encourages them to take a proactive role in caring for the baby after the birth. This, in turn, improves the parent-infant attachment after the baby is born as they interact and respond more to the baby’s needs. Therefore, the prenatal attachment could be an important factor determining the quality of parent-infant attachment after birth. Therefore, understanding the risk factors for prenatal attachment could help to identify parents at risk of developing parenting difficulties after the childbirth. What are the risk factors preventing a good prenatal attachment? 1. Mental health conditions (such as severe anxiety and depression) or pregnancy/ birth complications. 2. Detachment or ambivalent attitude towards the pregnancy. 3. Poor relationship with the partner. 4. Personal childhood experience of abuse/ maltreatment/ poor parenting by their parents. – type of conception (natural or assisted conception, such as IVF). 1. Mental health conditions: such as severe anxiety and depression. What interventions could help to improve prenatal attachment/bonding? 1. Avoiding unhealthy habits during pregnancy, such as smoking, alcohol, and recreational drugs. 2. Addressing couple relationship difficulties at the earliest. It might be useful to get help from a relationship counsellor if one or both partners have an insecure adult attachment style. 4. More emotional support from the partner. 5. Supporting parents when there is a prenatal diagnosis of a birth defect, such as a heart condition or neural tube defect. 6. Treatment of the mental health conditions of one or both the parents. 7. Addressing the stress associated with the transition to parenthood. This could be achieved through a structured antenatal education programme. 8. The practice of yoga and mindfulness. Now we would briefly discuss parent-infant attachment. What is a parent-infant attachment? After birth, the baby often feels worried/ threatened/ stressed due to the new experiences of the external world. When they do so, they cry and look out for comfort and security from the caregiver as a basic survival strategy. The way the caregiver responds to the baby’s cues (in response to the perceived fear/stress) determines the bond between them. This forms the basis of the parent-infant attachment. By about 18 months of age, the children would have developed a specific type of attachment style. Ainsworth and her colleague developed “Strange Situation” procedure to identify the type of the attachments. For further details about the children’s attachment, please read the NICE (UK) guideline. We now know that parent-infant attachment (that develops after the childbirth) is an important factor for social, behavioural and neurological development of the child. When the baby feels safe and secure in the relationship, this is called a ‘secure attachment’. This lays the foundation stone for a healthy growth and development, interaction in the society, future relationship, better achievements in school and less behavioural/ emotional difficulties. 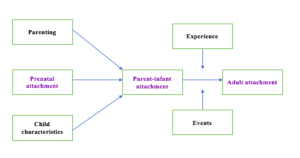 The postpartum parent-infant attachment depends on the regular psychological interaction between the child and the parent (or another primary caregiver) and parenting. When the baby feels unsafe, threatened or insecure (when the ‘attachment system’ is activated), he/ she looks for security from the caregiver. The way the caregiver responds to the situation determines the type of the attachment style the baby develops. This is the psychological perception of the child towards the primary caregiver (usually mother/ a parent). What is and isn’t parent-infant attachment? Why is the parent-infant attachment so important? A secure parent-infant attachment is an important factor for the emotional, behavioural and social development of the child. This also influences the attachment style for the future, including in the adult life (‘adult attachment’) and relationship. 6. Insecure Adult attachment and difficulties in the future couple/ marital relationship. Let us now briefly explore the concept of adult attachment. What is the adult attachment style? In the case of adults, the ‘secure base’ for the attachment is their romantic partners. 1. Secure attachment (low avoidance and low dependence): they are comfortable with intimacy and autonomy. 2. Preoccupied (Low avoidance but high dependence): they become too dependent on others while wanting an intimate relationship. 3. Dismissive-Avoidant (High avoidance but low dependence): they prefer to remain independent and does not wish to have an intimate relationship. 4. Fearful-Avoidant (High avoidance and high dependence): they are fearful of intimate relationship and prefer to avoid social interactions. If one or both partners have non-secure attachment style, then there could be problems in the couple/ marital relationship both during and outside the pregnancy. It might be useful to get help from a relationship counsellor if one or both partners have an insecure adult attachment style. 1. Attachment is an important factor for the relationship and social interactions throughout the life of a human being. 2. Prenatal attachment/ bonding can have an impact on the parent-infant attachment. 3. Both parents can develop a prenatal attachment. 4. Mental health conditions, poor couple/ marital relationship, lack of social support, smoking can impair the development of a good prenatal attachment. 5. Parent-infant attachment is an important determinant for the future social, behavioural and neurological development. This also can have an influence on the adult attachment pattern and couple relationship. 6. Adult attachment style of an individual can have a significant impact on the marital/ couple relationship. Early intervention is required if there are any couple relationship difficulties, especially if one or both partners have any non-secure adult attachment pattern. 1. Bowlby J. Attachment and loss (Vol. 1). New York: Basic Books; 1969. 2. Zimerman, A., & Doan, H. M. (2003). Prenatal attachment and other feelings and thoughts during pregnancy in three groups of pregnant women. Journal of Prenatal and Perinatal Psychology and Health, 18, 131-148. 3. Eswi, Abeer & Khalil, Amal. (2012). Prenatal Attachment and Fetal Health Locus of Control among Low Risk and High Risk Pregnant Women. World Applied Sciences Journal. 18. 462-471. 10.5829/idosi.wasj.2012.18.04.6491. 4. Cataudella, Stefania & Lampis, Jessica & Busonera, Alessandra & L, Marino & Zavattini, Giulio Cesare. (2016). From parental-fetal attachment to a parent-infant relationship: A systematic review about prenatal protective and risk factors. Life Span and Disability. XIX. 185-219. 5. Habib, C., & Lancaster, S. (2010). Changes in identity and paternal-foetal attachment across a first pregnancy. Journal of Reproductive and Infant Psychology, 28 (2), 128-142. 6. Bartholomew, K., & Horowitz, L. M. (1991). Attachment styles among young adults: A test of a four-category model. Journal of Personality and Social Psychology, 61, 226- 244. Infant Mental Health matters: How to build a happy brain?